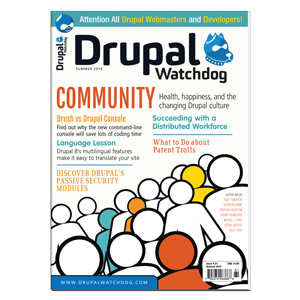 Prior to version 7, most Drupal users — and even administrators — had little need to be familiar with the inner workings of distributions and installation profiles. For versions 6 and earlier, when installing a fresh copy of Drupal core, one naturally would specify the minimum required information: database connection, website name, and superuser account. Yet one had no opportunity to affect the list of modules and themes initially enabled, the default content types, or any other configuration details. 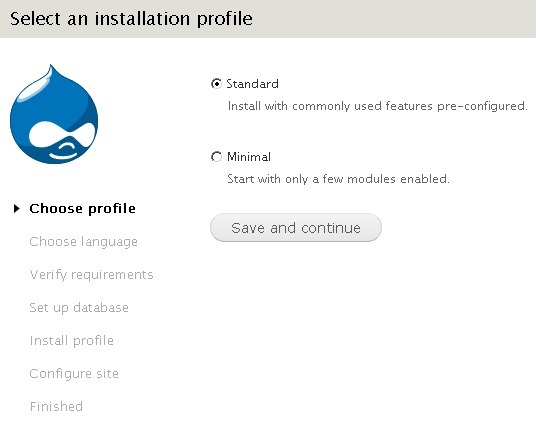 However, anyone installing Drupal 7 is presented with a choice of installation profiles: "Standard" (the default) and "Minimal". An installation profile comprises a set of files that completely describe how to configure a new installation of Drupal core, and can be made part of a distribution. The Drupal 7 installation screen mentions that the Standard profile offers “commonly used features pre-configured.” These include longstanding modules such as Color, Comment, and Search, as well as new ones such as Dashboard, Overlay, and Shortcut. The Standard profile includes the pre-built content types Article and Basic page, an administrator role, and even a taxonomy vocabulary (Tags). But what if you don't want most, or even any, of these preliminary settings chosen for you? You could instead opt for the Minimal profile, and add all your customizations on top of it each time you build a website. This could entail a lot of effort and time, clicking your way through GUI screens, downloading and enabling modules, and making numerous configuration changes. Instead, it would be convenient to be able to capture all of these actions and settings in your own distribution. In this article, we will learn how to do that. This topic is best explored through example, and so we will build a distribution containing settings I have found to be valuable as a starting point for most new client websites. Aside from a Drupal core and its usual technical requirements, the only other web technology you need installed on the server is Drush. The first step is to create and configure the Drupal website to be exactly the way you want it in your distribution. In our example, we download and install the latest Drupal version, and use the Minimal installation profile in order to minimize the amount of subsequent changes that need to be made. For performance reasons, I typically use database logging only when appropriate for the project; so I disable the core module "Database logging". I enable nine must-have core modules: Contextual links, Field UI, File, Image, List, Menu, Number, Options, and Path. The next step in the process is to create a makefile, which is a manifest file formatted in the standard Drupal ".info" syntax. The makefile starts with a Drupal core version number, which can optionally start with a specific release number; otherwise, the most recent stable release is automatically chosen. It then specifies the Drush Make API version (in our case, 2). The bulk of the makefile specifies all of the contrib and custom modules used in the installation, as well as contrib libraries. Each contrib module entry can have a version number, if desired. (We will exclude all version numbers.) It can also have a path to a Git repository, local or remote; otherwise, Drupal.org is used as the source for downloading. Similarly, each custom module must have a Git path (e.g., on GitHub). Our distribution is intended to serve as a foundation upon which to build new websites, so let's call it "Base". If any needed information is missing — typically an unresolved Git path — then Drush will replace the item with a placeholder, which will need to be updated with the correct value prior to finalizing the distribution. // Set the administration theme to Seven, instead of the default theme. 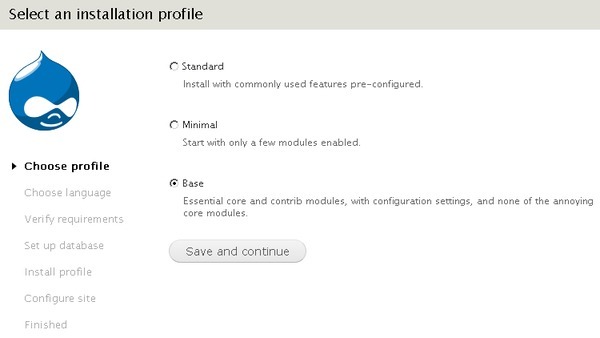 description = Essential core and contrib modules, with configuration settings, and none of the annoying core modules. Test the installation profile to verify that it is now an option when re-installing the website. This command generates a tarball, base.tar.gz, in the root directory. It also creates a settings.php file with secure permissions, and a files/ directory. This overview illustrates that it is not difficult to craft your own distribution, which you might decide to share with the rest of the Drupal community, on Drupal.org or GitHub. A complete study of object- oriented programming would fill this magazine; Larry gives us a firm grounding in the concepts and syntax of OOP in just a few pages. Chef Rosemary starts with simple ingredients and whips up a smorgasbord of easy recipes, perfectly suited for hungry nonprofit websites. Whether you’re a MacGyver or a MacGruber, Drush (DRUpal + SHell) may be your perfect, handy-dandy, all- purpose tool. Part 1. Michael J. Ross is a web developer who uses Drupal and other leading technologies to create custom websites for businesses and non-profits. He writes articles and book reviews, of which more than 560 have been published in print and online.